Sacromonte, which is actually known as Sacramonte by those who live in the area, is a famous neighborhood in Granada whose most important characteristics are the cave houses you can find there. The real origin of these caves is not clear, but they are definitely there and have served as homes to inhabitants since the 16th century, coinciding with the expulsion of the Muslims and Jews from Spain, a population that subsequently united the nomadic gypsies who arrived in Granada. This ethnic variety is still clear to see today. Flamenco was a highly developed art form in Sacromonte, more than anything because of the gypsies, where improvised parties were common, along with the impulse toward new artistic currents which attracted bohemians and those interested in art in general. Today, Sacromonte still has its reputation as the “Mecca for flamenco,” even if the parties for fans and followers of flamenco are less frequent, since it is now more common for shows to be put on for tourists in the city in order to make money, than to have a traditional flamenco party with fans who come to the caves to enjoy a night of rhythm. Even so, it is still possible to enjoy the best flamenco in the caves of Sacromonte. Some, like the Cueva de la Rocío have adapted to the times and offer the music and dance show along with a dinner menu so that visitors can spend a complete, enjoyable evening there. 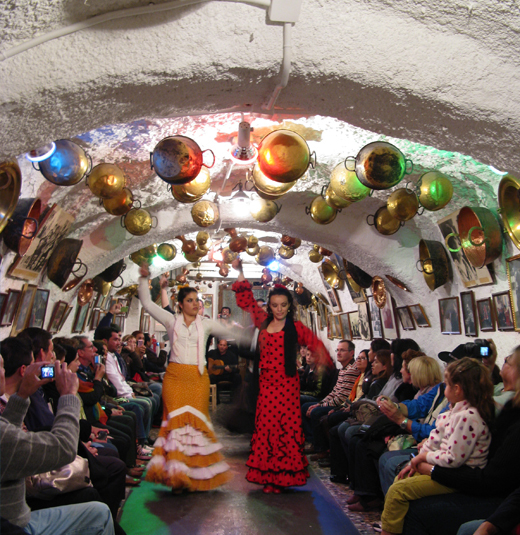 The Cuevas los Tarantes is another location in Sacromonte where visitors can enjoy food and gypsy shows like flamenco. However, as many tourist experiences have shown, these places are much more expert in dance than in food. So it’s a good idea to go to the city center to enjoy better quality, traditional food from Granada. Furthermore, the fame of the caves of Sacromonte is adapting to new times. There are now some that are also hotels that cater to tourists who want to live the flamenco experience from the inside out, spending a few days alongside their neighbors. Those who have the opportunity can also take flamenco classes which are given in many of the caves in Sacromonte. The most outstanding students even get to perform at parties with a big turnout. Posted December 21st, 2015 by amerispan amerispan & filed under AmeriSpan Blogs.